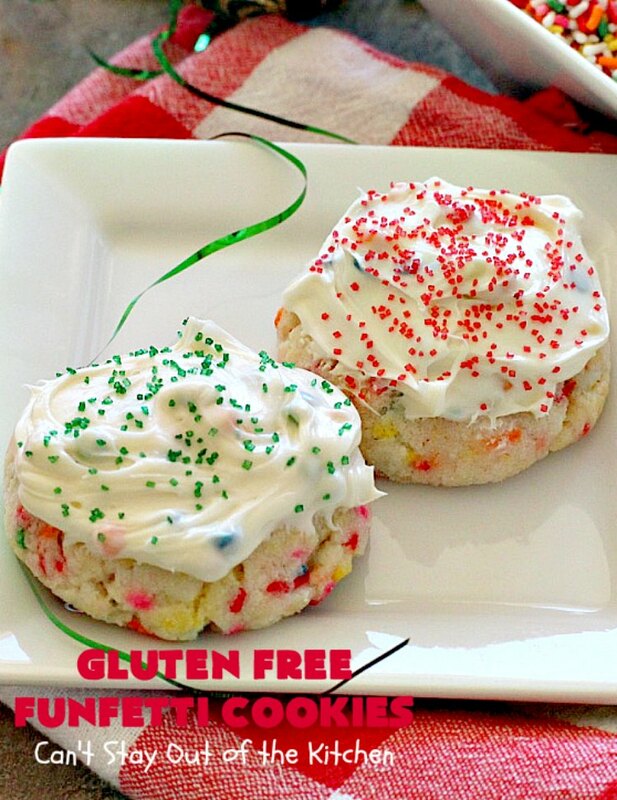 Gluten Free Funfetti Cookies are such an amazing treat! I’m a funfetti-sprinkle kind of gal. These easy five-ingredient cookies are the ultimate in simplicity and deliciousness for your gluten free friends. I used a Pillsbury gluten free funfetti cake mix, along with sprinkles and rainbow chip frosting. Seriously, this recipe was super easy. I’ve always loved funfetti in cakes and I have a ton of recipes using funfetti including bars made with white chocolate, fudge, plain, and two different kinds with M&Ms including one with cheesecake! 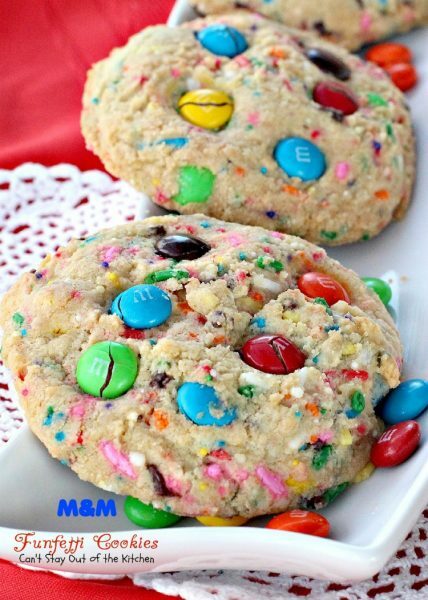 I’ve also made funfetti cookies like chocolate, red velvet, coconut, gooey butter, M&M, chocolate chips or plain. 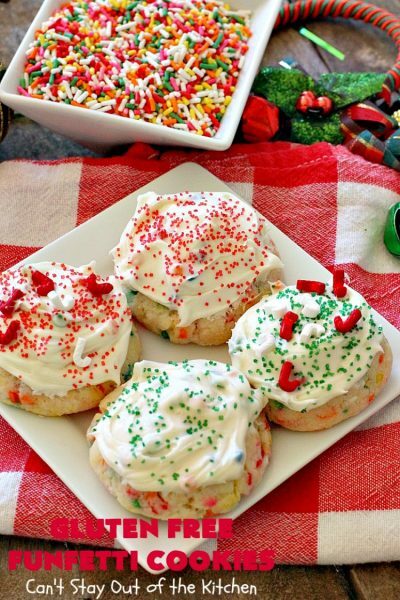 Not to be outdone, funfetti is terrific in cupcakes, and pancakes, too. 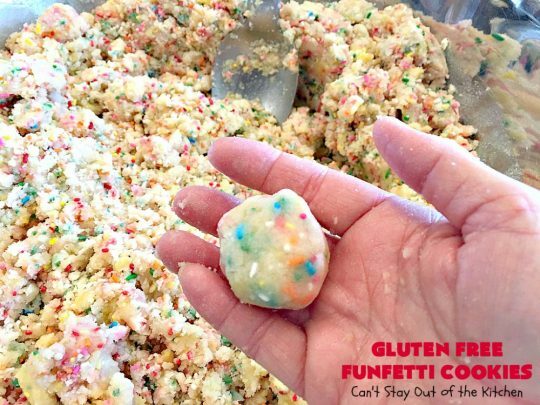 Yes, just pour in the sprinkles and funfetti and I’m one happy camper. We have several people that we bake for over the holidays that have either Celiac Disease or gluten intolerance in one way or another. (Not always digestive issues, some get inflammation, others lupus). So this year for our Christmas Cookie Extravaganza I made three different kinds of gluten free cookies so they wouldn’t feel left out. These cookies along with Gluten Free Chocolate Chunk Cookies and Coconut Date Balls are the ones they got to choose from. 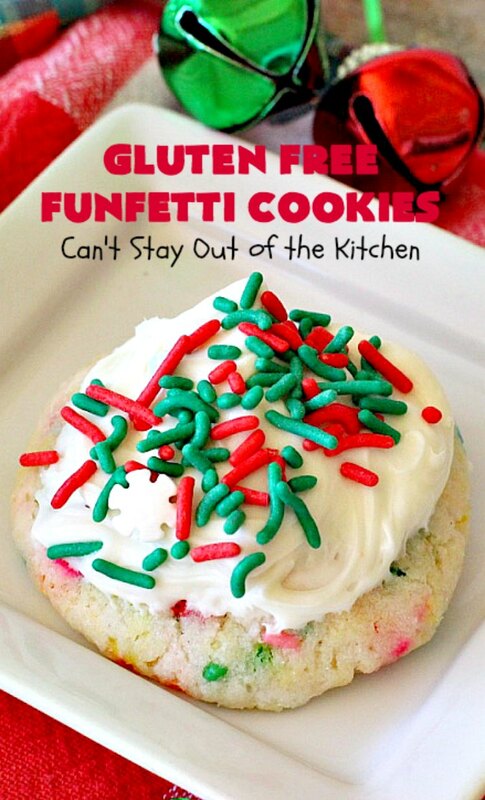 I have had fantastic reviews already about all three of these gluten free cookies. 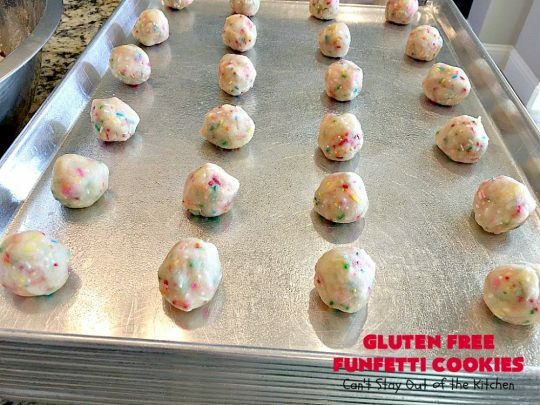 Gluten Free Funfetti Cookies are just fun cookies to bake too. I have to admit, I spent more time than I should have decorating these jewels. 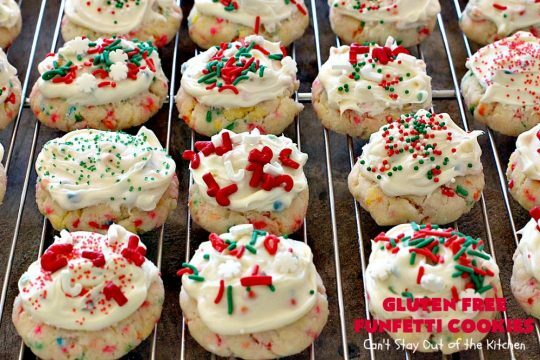 I had seen some cool sprinkles with candy canes and snow flakes before the season began and snatched them off the shelf before I even had a purpose in using them! Then when I went to the store and couldn’t find white chocolate chips at the store, 🙁 I decided to scrap my plan to make these as sandwich cookies and just go ahead and ice them and sprinkle lots of funfetti and sprinkles on top. My gluten free friends were sooooo thankful that I took the time to bake something they could eat. Quite frankly, I had a lot of folks tell me they enjoyed the gluten free cookies even though they don’t have problems with gluten! 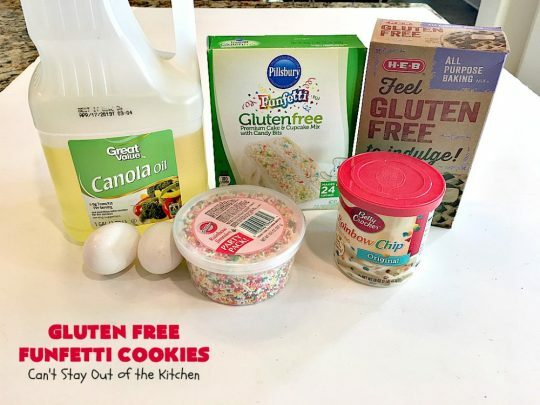 Let me say a couple of things about working with gluten free products. The texture is very fine and not like working with regular all-purpose flour. [wheat flour]. I found when I was rolling the dough into balls, sometimes the balls would crumble apart. I had to really squeeze the dough together hard before re-rolling into balls. That helped the ingredients stick together better. 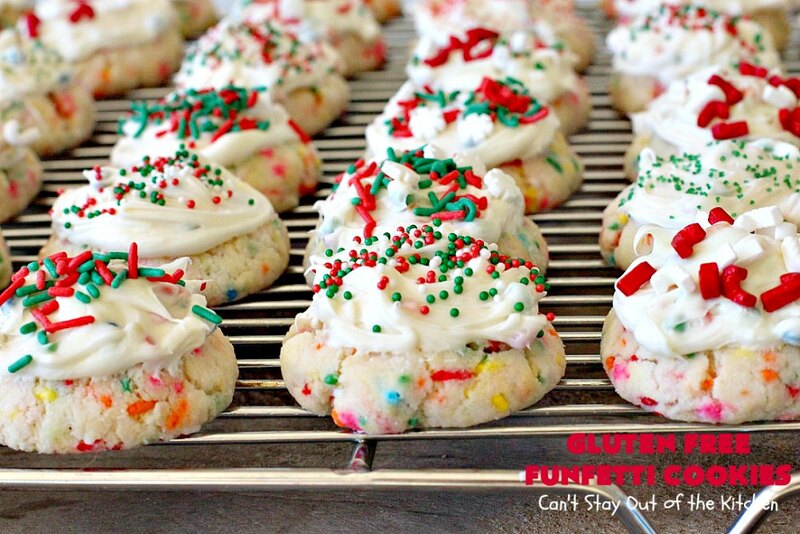 You can use a little more oil in the recipe if you want a flatter cookie. I really had no idea how they would turn out, so I wanted to avoid a runny, flat cookie. And, because we pack up our cookies and bag them for everyone it worked better for me to have a plumper, more solid and less frail cookie to work with. However, if you want them to flatten out a little more, consider adding an additional tablespoon or so of oil to moisten the batter just a little more. 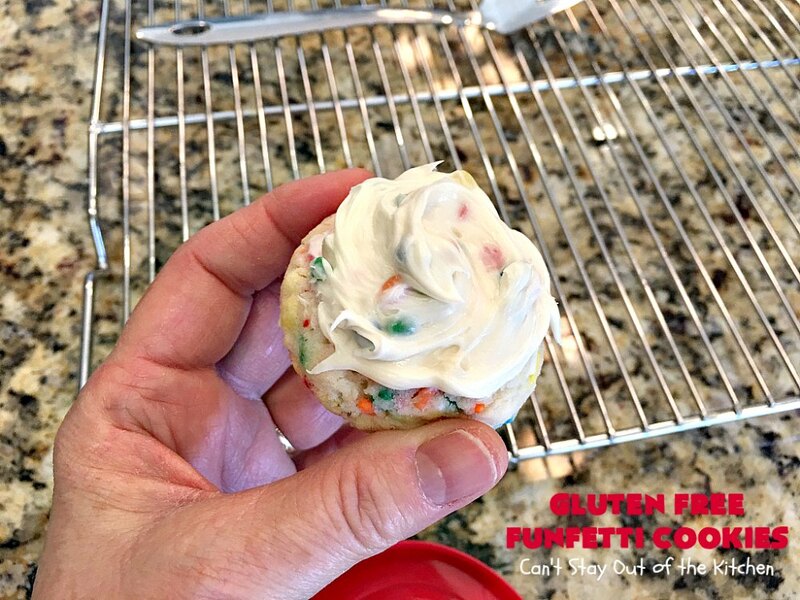 If you’re looking for a scrumptious gluten free recipe to bake for family or friends this holiday season (or for birthdays or other special occasions), give these delightful Gluten Free Funfetti Cookies a try. Your family and friends will be so excited and you may find you enjoy them too. 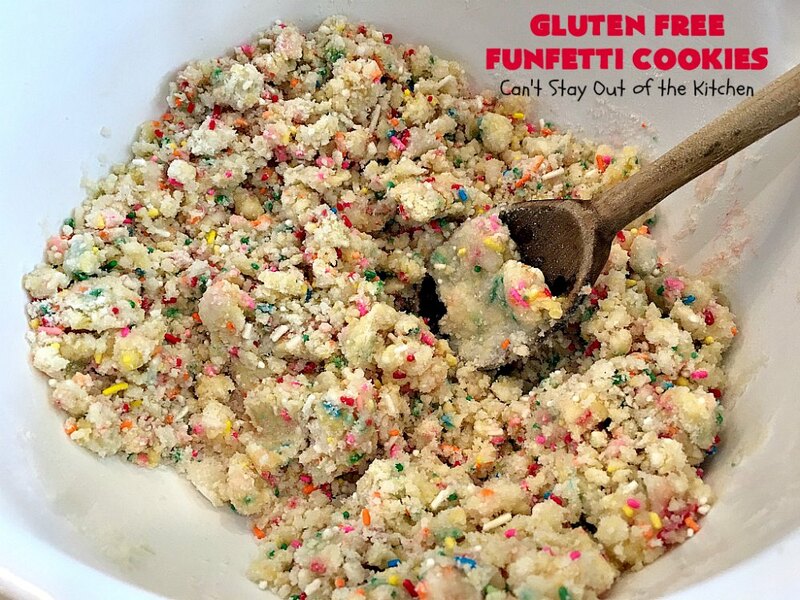 Gluten Free Funfetti Cookies are spectacular. You can decorate the icing with any kind of sprinkles, but I used holiday sprinkles for the season. I also used colored sugar to decorate the cookies. Place cake mix in a mixing bowl. Add sprinkles and eggs. Stir together and add just enough oil to moisten the dough. I could have added another tablespoon of oil, but I left it like this. This is a very fine, grainy texture. Sometimes I had to really squeeze the dough together hard before rolling into balls. Otherwise, when I started to roll the dough into balls, it would break apart. Place cookie dough balls on greased cookie sheets. Bake at 350 about 15 minutes or until done. My cookies took about 24 minutes to bake because I had four racks in the oven at once with 24 cookies per sheet. I rotated the racks every eight minutes. Cool cookies completely before adding icing. 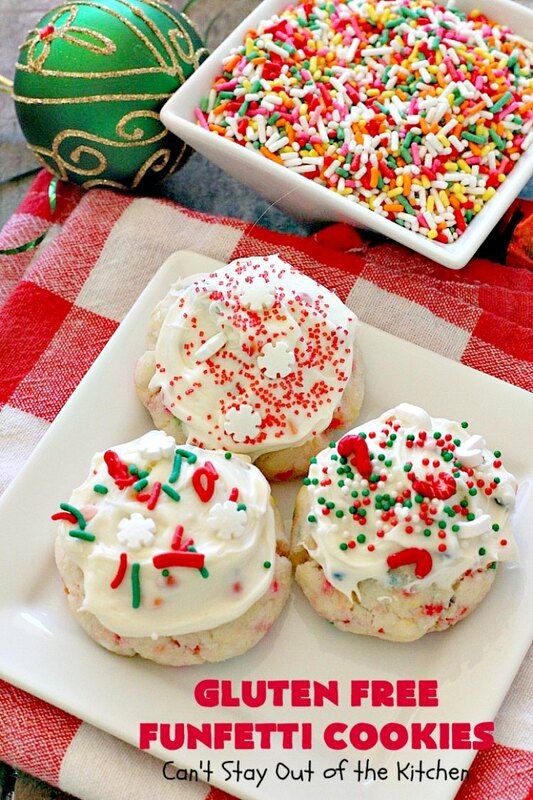 Add sprinkles to cookies and place on cookie racks to allow icing to set. This will take about 15 minutes. I used several different kinds of sprinkles on top of the icing and mixed and matched them. Some of the sprinkles I found had white and red candy canes, another one had snowflakes! 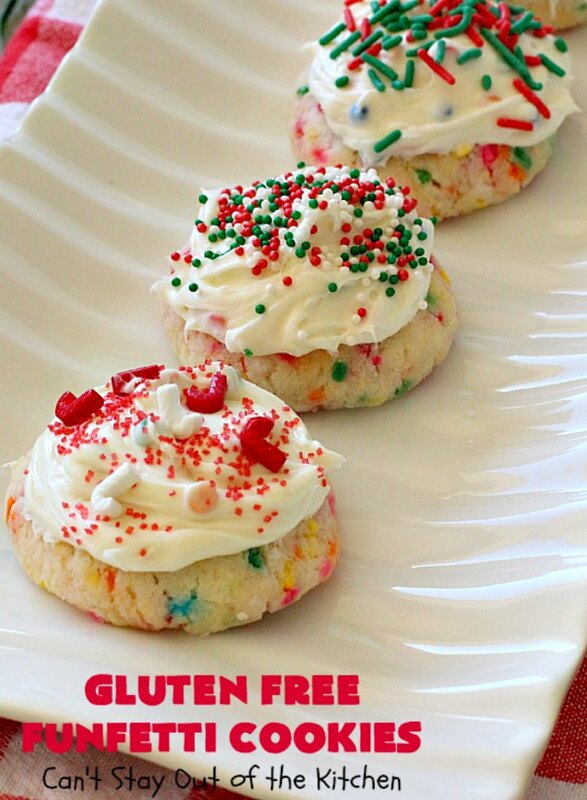 I loved the idea that I could serve my friends and family a few gluten free dessert options for the Christmas holidays. These delectable cookies use only 5 ingredients! 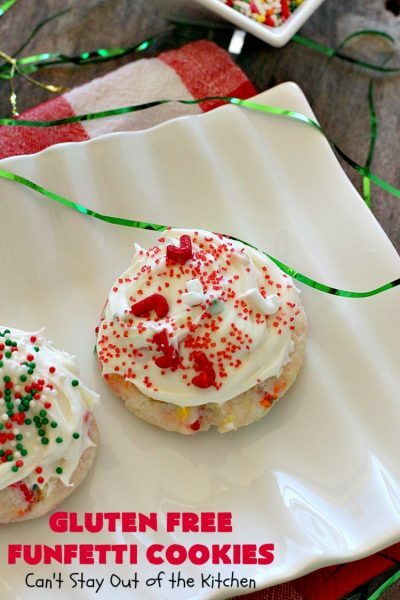 They're perfect for holiday baking, Christmas cookie exchanges and even birthdays. Wow your gluten free friends and family with these scrumptious treats. In a large mixing bowl, mix the cake mix and eggs. Add just enough oil to moisten the batter. 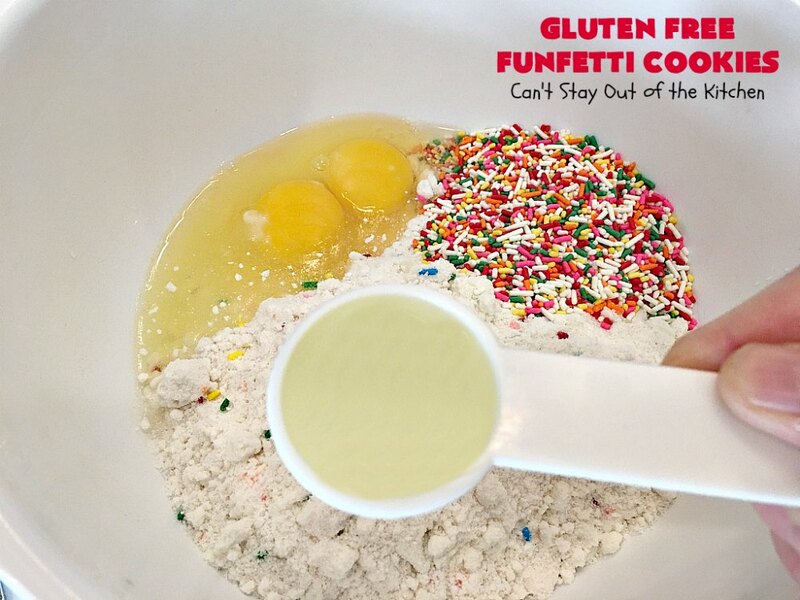 Stir in funfetti sprinkles with a wooden spoon to combine. 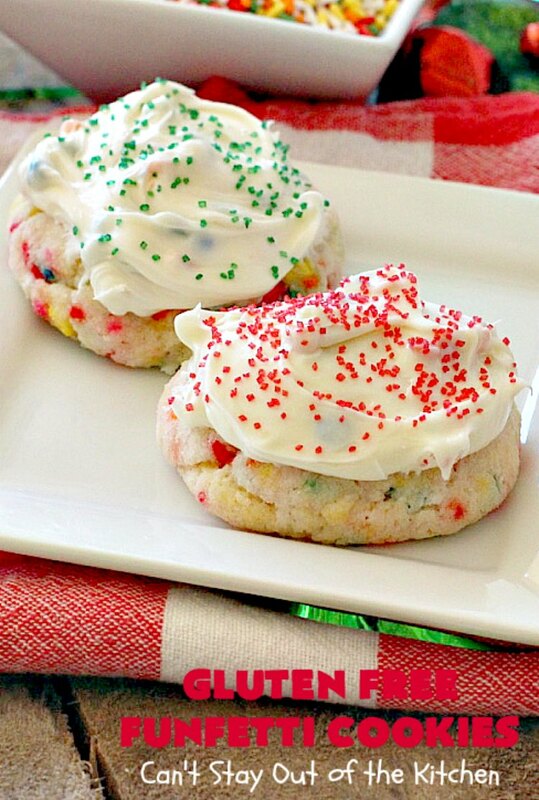 Spread frosting on top of cookies, as desired. Sprinkle with additional sprinkles, if desired. NOTE: If you use nonpareils rather than jimmies the color bleeds into the cookie dough and you will have a lavender-colored cookie instead. NOTE: My eggs seemed extra large or jumbo rather than regular sized large eggs. You have to adjust the oil accordingly. If your mixture is dry, add more oil. Otherwise, add just enough oil to mix the dough. NOTE: When making a single batch of the cookies I used ½ cup oil. When making eight batches I decreased the oil to only 1/3 cup per batch. NOTE: Working with gluten free flour is an adventure. I found that I needed to really squeeze the dough into my hands to get the crumbs to adhere together before rolling the mixture into balls. Otherwise, sometimes once I started rolling, the dough would crumble apart in my hands. Gluten Free Funfetti Cookies are so delicious. You’d never be able to tell you were eating a gluten free treat! These are wonderful for holiday baking, birthdays or even potlucks where you have folks with gluten sensitivities. 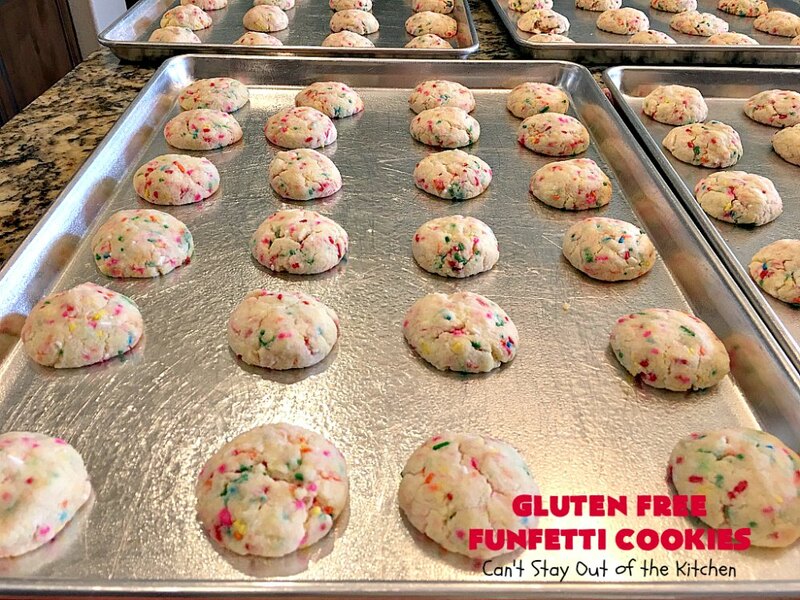 Gluten Free Funfetti Cookies were raved over even by some of our friends who aren’t gluten intolerant. I’m so excited to try this recipe. My son has been gluten free for about a year and said to me today “Christmas cookies?”. Of course I responded with “Sure! 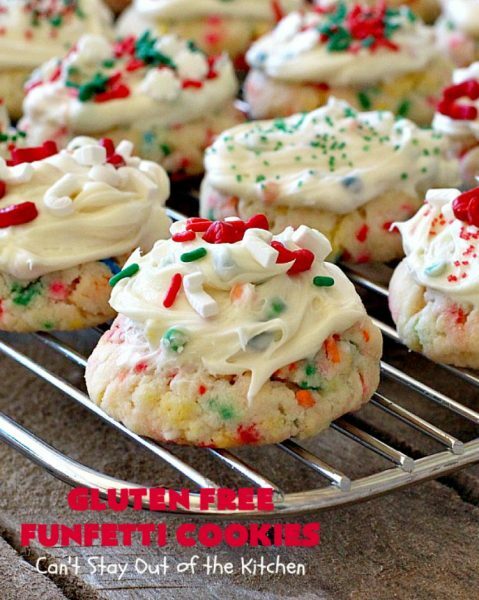 We can make some Christmas cookies!”, but in my mind I was dreading making gluten free cookies (or any cookie) from scratch, which I’ve never done before. So what a relief that I found this recipe and can’t wait to make these. I know my son will really enjoy adding the sprinkles! Hi Julie. 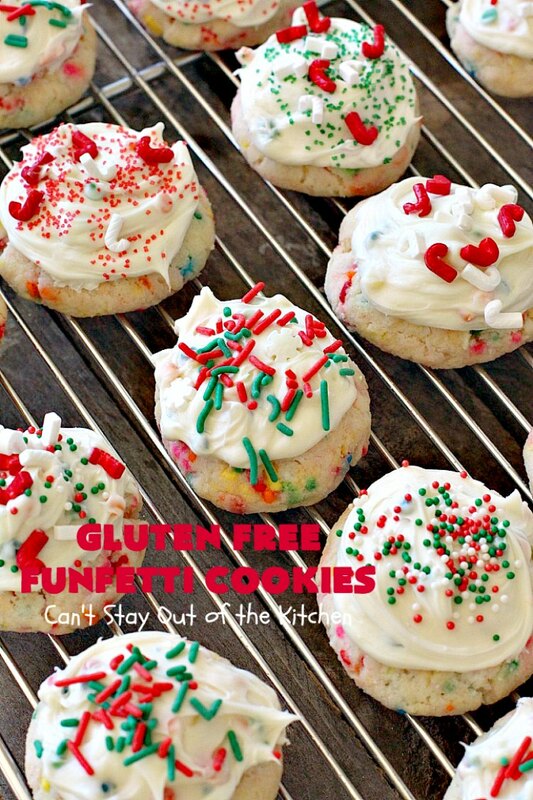 I made these for several people on our cookie baking list this year who have gluten issues. Everyone loved them. I also have several other gluten free cookie or brownie recipes on this blog that you may want to try. Enjoy.